The Tax Justice Network blog has a whole list of examples of tax havens saying “we are not a tax haven”. They claim to be well-regulated, stable international financial centres instead. 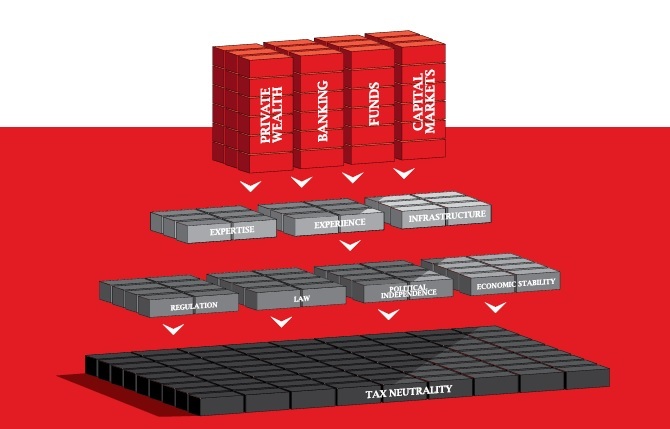 “Tax neutrality” means that Jersey “offers no Capital Transfer Tax/Capital Gains Tax/Value Added Tax/Withholding Taxes/Wealth Taxes, provides tax certainty and allows fiscally efficient cross-border investment”. The brochure also presents ratings by international bodies such as the IMF and OECD as endorsements, at the same level as such industry accolades as “International Financial Centre of the year” awarded by Citywealth magazine. The IMF apparently rated Jersey as “one of the best global international financial centres” (no source provided), while the OECD found that Jersey “demonstrated a responsive and cooperative approach” (which seems rather faint praise). Jersey is ranked 9th on the Financial Secrecy Index.